Infinite regress is only not possible by being bounded in some of the limits of applicability we comprehend for ourselves and our reality. Some people can’t imagine how it work as they have no frame of reference to comprehend. 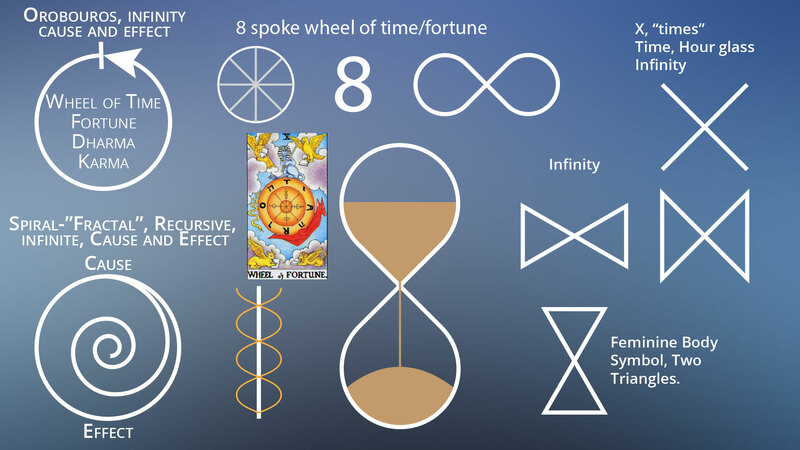 Some people are not aware how infinity is represented in reality, of which I have presented some parts of understanding this in my presentation on “Elemental Quaternity – Reality and Consciousness Symbolism“. An infinite regress can be compared to a loop, to cycles, and nature-reality-existence does use cycles to iterate into almost infinite repetitions. Causality can be an infinite cycle into the past and future, despite this comprehension being amiss in most understandings of how reality functions. I have already described this aspect of cyclical, recursive, looping infinite causality in “Consciousness and Causality Pt.2“. 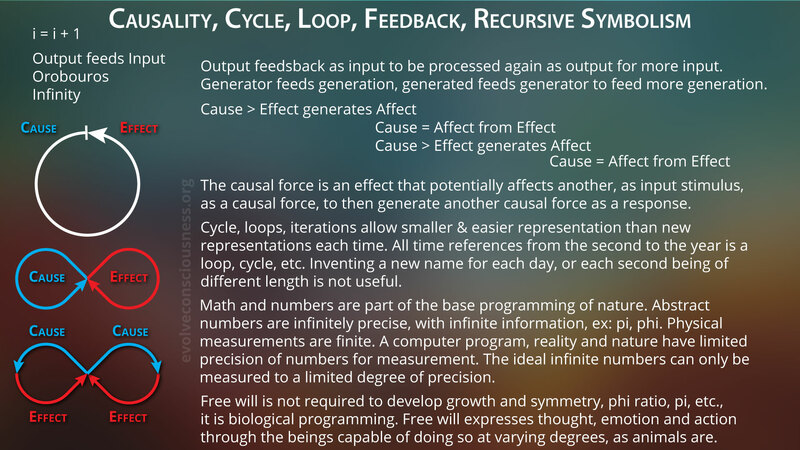 Recursions, loops and cycles are not only demonstrable in causality itself, but also demonstrable in computer programming. Infinite regress, or infinite progress, causality going backward or forward, is possible. The issue is in consciousness recognizing this possibility already demonstrated in reality, which many philosophical models deny is possible, hence the appeal to the “argument from first cause” to justify the invention of “god” as the final beginning and end point, the alpha and the omega, etc. If you want to posit a something that exists (“God”/source) beyond our reality and is not bound by the laws of logic or causality, then we can imagine any possible source or sources that operates in any way contrary to our established existence. To imagine something outside of existence, somewhere else, automatically means it doesn’t exist. if it is within existence, then it operates according to the laws of existence as everything else is bound by. In essence, it is an unreality compared to our reality, since the laws you use to imagine this other reality, unreality, seem to be invalidated and cannot be used at that level because it is an unreality that does not operate in the same capacity as here. So anything can be imagined to take that position as the origin of our universe if it is outside the universe. The popularized notion of “God” is but one version, but it has been widely spread for millennia as the first cause of everything that contains everything, etc., in order to provide an answer to questions that we imagine from consciousness, about origins, creation, purpose, meaning and so forth. Not having an answer to deep questions of meaning and purpose in life, can leave an abysmal void or darkness in comprehension of reality that produce psychological confusion, anxiety, insecurity, doubt, discomfort and fear, fear from the unknown, of the unknown dark void in consciousness without an answer. We want conclusions and answers to deep questions about life, or else we may feel lost with such a gap in the web of reality we conceive of. This imagined answer using various justifications, is a gap-filler. Ask many people how the belief in “God”, or even another possible invention, Jesus, makes them feel. Beliefs from imagination can make you feel good. All it takes is for you to believe it, and your psychological makeup will be affected. Holding a belief as “reality” and “truth”, creates that “reality” and “truth” in your subjective multi-verse, and it crates psychological effects from being bound to that belief that you have trust, loyalty and faith towards. If you accept in the possibility of what is referred to as “God”, “source”, “singularity”, “one”, “all”, “mind”, “spirit” as the origin of the universe, then you cannot deny other possibilities that also deny the laws of logic and causality that allow you to conclude “God” is a legitimate reality and truth. To employ causality and logic as universal laws without breaking them, would necessitate the infinite regress as the only logical conclusion, and it is possible as I will explain, as long as we follow the laws of logic and causality. To accept the “argument from a first cause”, is to deny the universal truth of causality and logic simply in order to justify your imaginary belief that attempts to provide a universal one-size fits all, catch-all belief to answer everything but doesn’t fit into any of the laws of thought that you used to imagine its existence. For “God”, we don’t have to keep applying laws like logic and causality, because, how very convenient, “God” creates all of that and it is exempt from it all, no rules or anything of logic apply to “God”. There is no logic or causality to be used to arrive at the proof for its existence since logic and causality is negated as a means of operation for that thing. Only imagination is required, with some faulty logical constructs to give the appearance of it being sound and valid. To presuppose consciousness first as the primacy of existence itself is to be cut off from the causal chain, as it requires continuity in space and time, which “god” is not a part of, being that it is outside of our reality in order to create it, and does not follow in the chain of causality. If there is no space or time outside of our reality, then there is nothing to be affected causally, as a cause precedes an effect, requiring a past. If there is no past, there cannot be a cause in the past to create the effect in the future. Infinite regress, loops, recursion, repeating cycles, are possible, but some people assume it can’t be possible. They can’t imagine the universe as always existing, or an infinite chain of causality beyond the one alleged source going further back before it. They need some starting point for their own sanity (psychosocial need for an answer that closes the loop). They create beliefs in a beginning called “God”, and then say that this is the end of the road, there can’t be something else behind this imaginary force, ad infinitum. This is not desired to have as a conclusion, because it does not conclude, it goes on forever, it does not wrap things up in a nice little package, with a beginning source point that our minds are comfortable with conceiving of as the origin for everything. Infinity can boggle some people’s minds, and accepting a concept based on infinity is not desirable to the majority of consciousnesses as they have no frame of reference in reality itself to demonstrate that possibility, whereas I do, as I explained in the two examples above. Therefore, a finite origin in causality is most desired as a source narrative, but then this breaks the laws of causality that everything created needs a cause to make it so. The rhetoric of special pleading and apologetics allows this error to be dismissed by many, which allows them to remain attached and bounded to this belief. Infinite regress/progress can only be where there is time, with causality to exist in time. No time means no causality, at least as it operates in this universe, causality requires one thing followed by anther, hence time is a prerequisite to causality. 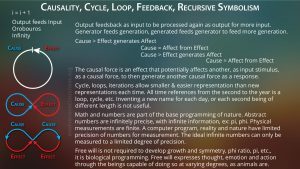 Causality is represented by the prime ratio, 1:1 cause:effect for the universe, the singularity being “causality” itself it seems, when we understand that 1:1 = 1 as the infinite looping generation capacity. 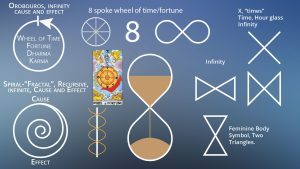 Time may not have a beginning and end, so everything in time can be limited in time, which are all the causes which were affected by effects or are effects, and effects created by those causes that produce more affects and new causes. But time always was, infinite. Think about it, the only accurate concept for infinity is time. Time is what is automatically associated with the symbol and meaning of infinity, even before anything else can be infinite to exist within time and be infinite. Time would be the first demonstrable cause, possibly not the first is reverse causality to the creation of the universe, maybe there is another cause there, with time behind it, or maybe there are two causes in between, or infinite causes. This allows an infinite regress, because time itself is infinite and precedes space to form the space-time universe of our existence. Time is the only thing that could enable the infinite regress, as it is infinite. What happened before the universe? Before the singularity? It’s only assumed to be unmoved, uncaused, but that is only an assumption that has no basis, as everything else has a beginning, so too then would this singularity, and this indeed necessitates an infinite regress as inevitable, unless we arbitrarily assign one or more causes as a truth, instead of a belief in a possibility we can’t confirm. An infinite regress/progress is not impossible, it is only incomprehensible to some because they project the laws of this universe and existence onto something they have no real information about, so its only imaginary guess work and projection of our own understanding onto something we have no input of knowledge to possibly relate to. We imagine and create concepts, ideas and beliefs about the alleged origin of our universe. Ex: Our universe, then time, something else, something else, loop or infinite something. We limit what we think something can be, beyond our own comprehension, by our own comprehension being projected onto it in order to validate its capabilities. There can be more than one source, all there is, is a source to the universe if we accept the evidence for the big bang, so call the source a singularity for instance, but that can be one source from where it is said to be, along with other “sources” along with it, other causes, that cause effects and on and on it can go. Who knows. We are restricted to how we understand this reality and universe for causality, and that is how we come to know. To impose one single absolute belief as the one “true” source of existence, the universe, reality, is narrow-minded, considering how it defies many principles of understanding and negates other possibilities as just as valid. What is set in motion, cannot be undone once it has entered the plane of effects, as we understand it here. So we exist because of being in a causal chain of effects stretching back in time, possibly finitely as per the concept of the age of our universe, maybe self created as the belief in god being self-created, but maybe before the universe, time can exist and other things happening and existing that is not simply god, but can be anything, if we accept something before the universe instead of it being self-created. And this universe might evolve into something else or be a cause for something else to be in the future. The point is, there doesn’t have to be one final unmoved mover uncaused causer with respect to the creation of the universe, as the singularity can also be an effect of some other cause, on and on. And the future, of trillions of years, who knows what happens that gets created in the future. If there is a “source” of infinity singularity as a cause to the universe, it can be seen as time being infinite, and then other things before possibly. If you understand how we all are causally interconnected and all causally involved in aggregately creating our reality, the human world, not the objective universe, then this chain of causality for our human actions can be mirrored into other understanding, correspondence and analogy to posit a possibility, an alternative to the imagind belief in “God” as being one causal force. There can be multiple causal interaction or forces in another “source” location, if indeed there is such a place, that interconnect in a causal chain to manifest the big bang singularity whatever, and then the universe develops. This is logically consistent, but may not be the truth either. If you want to apply as above so below, then this one fits the most into how things actually work in terms of the reality we live in here on the ground as human beings as creator/generator mirrored onto the universes creation. It is the most mirrored concept you can have of how causality works, as none of us are isolated islands creating our human world, why should the source of our universe be any different? Why not accept this version of source creation? The standard model is an argument from first cause, which violates the universal truths of causality and logic. An infinite loop on a computer will consume the available memory until it runs out. It doesn’t run and die in processing, it keeps running, existing on its own, a life of its own, consuming more memory energy to exist. This is how life operates, and maybe the overall universe, as we consume energy until we don’t anymore, known as death. Eventually resources have to be renewed because of consuming them, such as replanting. We consume energy in order to continue our existence until we don’t exist anymore and stop consuming energy for sustenance at that point. An infinite loop on a computer can be demonstrated, limited by the resources it can consume, and we are also finite and limited by the resources we can consume. The source of creation can be an infinite regress in causality, and an infinite progress in causality in the future, that is itself in a form of a loop, consuming forever or not. Instead of something dying, it keeps going as long as there is energy. What powers this universe? Is there an infinite source that powers it? If there is, then the universe will have an infinite future, despite having a finite beginning. Do you understand that if something has a beginning, but no end, it is still infinite? How could it not be infinite if it was infinite even in only one direction of causality? Causality is a framework that can be demonstrably shown as a truth of our reality. It’s also possible the universe, micro quantum, everything, came from nothing, no singularity source as such. If you believe in causality as a universal truth, then there is no starting point for anything, as everything has a beginning forever, like the chicken and egg forever without one being the starting point, god creating universe creating god forever infinite regress. If you don’t believe in cause and effect as a universal truth, then you can have an egg, without needing a chicken first, or vice versa. If something like “god” can be imagined to come from nothing, then the universe can come from nothing, not only the concept of “god”. The concept of god comes from consciousness, not from existence in reality. Concepts, generals, universals, ideas, that are potentially real and true, are generated from a foundation in the specific particulars of reality, existence, the universe. If imagination creates something that is not expressed through a particular in reality then it cannot be a concept that is made up of particulars in reality. A generalized concept cannot be formed without particulars. A causal link is invented to substantiate the belief in existence. I can demonstrate how we create morality or immorality. I can demonstrate how we imagine and envision better ways, Truth, Good, Right as Truth Level 2 ideal potentials to create as reality. I can show you morality or immorality in reality, I can tell you about imagination of better ways to live that I create from comparison to reality, and then we can live in that better way that I created from imagination. Anything as part of reality, as part of us, can be demonstrated, and I do demonstrate it. “God” as a belief is unreality, non-existence, if it is assumed to be outside of our existence and not bound by any laws to imagine it as being “Real” somewhere else, some imagined “Absolute”. If it is inside existence, then it is bound by the laws we understand to gain knowledge, and cannot conveniently invalidate laws of existence that we recognize, such as causality and logic. 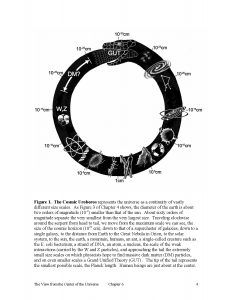 Here is even a picture of a loop of the universe as the cosmic orobouros to show once more how an infinite looping is possible to understand in imagination, therefore to conclude that there “must” be a single, one, “first cause” as some infallible argument, is wrong, as it is not the only possibility. It is simply the only possibility you have been able to accept. I have demonstrated various ways to imagine infinite regress and progress. There is no “absolute” need for the fallacious “argument from first cause” as the infallible premise to base a belief upon.